After the first release of the foundational ONtology Selection and Explanation Tool ONSET half a year ago, we—Zubeida Khan and I—continued its development by adding SUMO, conducting a user evaluation, and we wrote a paper about it, which was recently accepted  at the 18th International Conference on Knowledge Engineering and Knowledge Management (EKAW’12). There are theoretical and practical reasons why using a foundational ontology improves the quality and interoperability of the domain ontology, be this by means of reusing DOLCE, BFO, GFO, SUMO, YAMATO, or another one, in part or in whole (see, e.g., [2,3] for some motivations). But as a domain ontology developer, and those who are potentially interested in using a foundational ontology in particular, do ask: which one of them would be best to use for the task at hand? That is not an easy question to answer, and hitherto required from a developer to pore over all the documentation, weighing the pros and cons for the scenario, make an informed decision, know exactly why, and be able to communicate that. This bottleneck has been solved with the ONSET tool. Or, at least: we claim it does, and the user evaluation supports this claim. Behind the scenes is a detailed comparison of the features of DOLCE, BFO, GFO, and SUMO, and an efficient algorithm. The latter and the main interesting aspects of the former are included in the paper; the complete set of criteria is available in a file on the ONSET webpage. 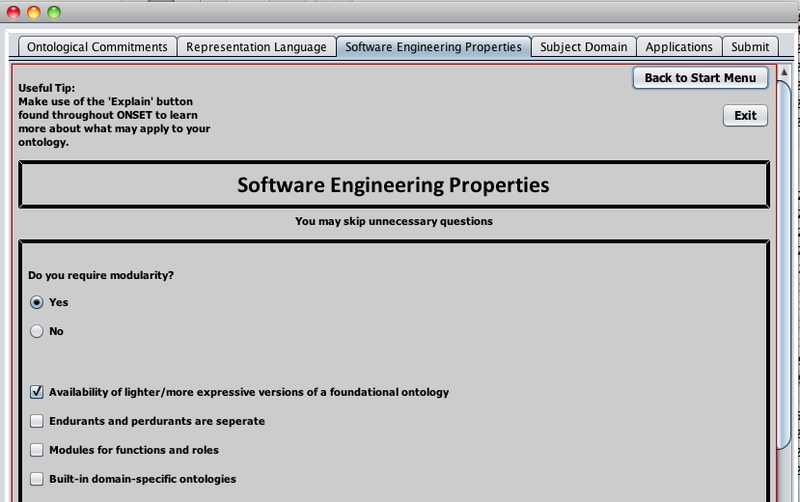 You can play with ONSET using your real or a fictitious ontology development scenario after downloading the jar file. If you don’t have a scenario and can’t come up with one: try one of the scenarios we used for the user evaluation (also online). The user evaluation consisted of 5 scenarios/problems that the 18 participants had to solve, half of them used ONSET and half of them did not. On average, the ‘accuracy’ (computed from selecting the appropriate foundatinal ontology and explaining why) was 3 times higher for those who used ONSET compared to those who did not. The ONSET users also did it slightly faster. Thus, ONSET greatly facilitates in selecting a foundational ontology. However, I concede that from the Ontology (philosophy) viewpoint, the real research component is, perhaps, only beginning. Among others, what is the real effect of the differences between those foundational ontolgoies for ontology development, if any? Is one category of criteria, or individual criterion, always deemed more important than others? Is there one or more ‘typical’ combination of criteria, and if so, is there a single particular foundational ontology suitable, and if not, where/why are the current ones insufficient? In the case of conflicts, which criteria do they typically involve? ONSET clearly can be a useful aid investigating these questions, but answering them is left to future works. Either way, ONSET contributes to taking a scientific approach to comparing and using a foundational ontology in ontology development, and provides the hard arguments why. We’d be happy to hear your feedback on ONSET, be this on the tool itself or when you have used it for a domain ontology development project. Also, the tool is very easy to extend thanks to the way it is programmed, so if you have your own pet foundational ontology that is not yet included in the tool, you may like to provide us with the values for the criteria so that we can include it. Startpage of ONSET, where you select inclusion of additional questions that don’t make any difference right now, and where you can apply scaling to the five categories. 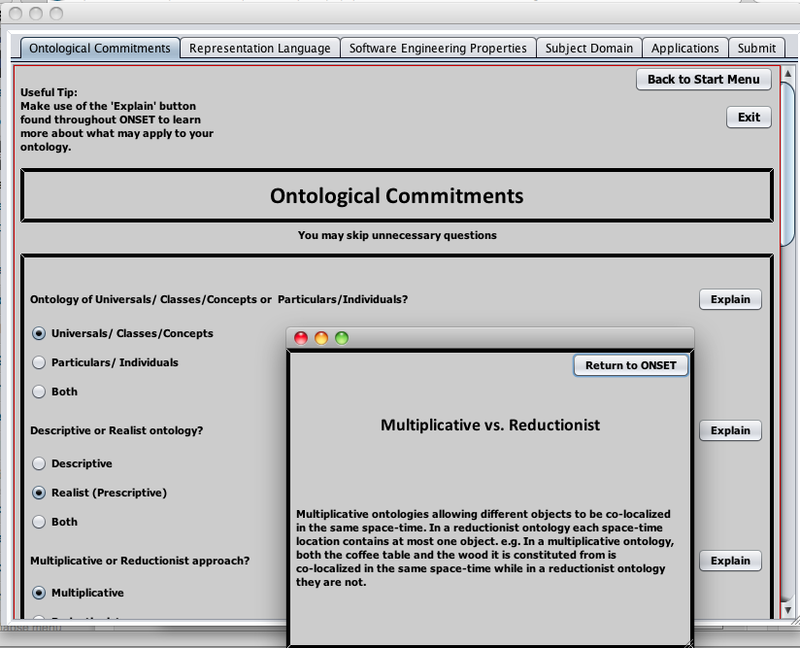 Section of the questions about ontological commitments and a pop-up screen once the related “Explain” button is clicked. Another tab with questions. In this case, the user selected “yes” to modularity, upon which the tool expanded the question so that a way of modularisation can be selected. 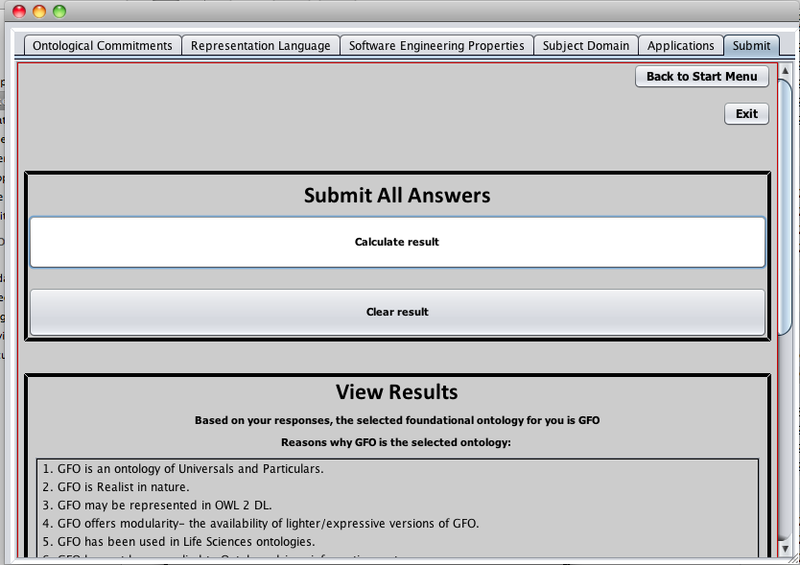 Section of the results tab, after having clicked “calculate results” (in this case, of a fictitious scenario). Conflicting results, if any, will be shown here as well, and upon scrolling down, relevant literature is shown. Keet, C.M. The use of foundational ontologies in ontology development: an empirical assessment. 8th Extended Semantic Web Conference (ESWC’11), G. Antoniou et al (Eds. ), Heraklion, Crete, Greece, 29 May-2 June, 2011. Springer, Lecture Notes in Computer Science LNCS 6643, 321-335. Borgo, S., Lesmo, L. The attractiveness of foundational ontologies in industry. In: Proc. of FOMI’08, Amsterdam, The Netherlands, IOS Press (2008), 1-9.